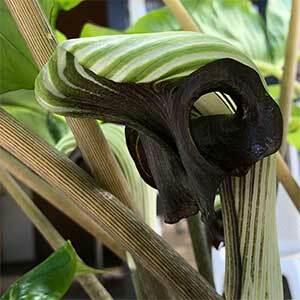 With a flower head that resembles that of a cobra Arisaema ringens is a standout plant for a shaded garden. This is a species that comes in two forms, one with a spadix thats is a very deep purple, the other with a green spadix. It will grow well in the garden in a woodland situation, it is equally at home in a container. The foliage lasts well through summer and over time the plant will form an attractive clump. A moist yet well drained soil and good dappled shade are the keys to growing this plant. In the garden dig the soil over well before planting. Add some well rotted compost and cow manure. Bulbs should be planted at around 10 cms (4 inches) deep. Keep moist yet never wet and soggy. A liquid fertiliser applied every 3 weeks after the first shoots appear will be adequate in good soils. Arisaema ringens can be propagated from seed, or you can divide established clumps. 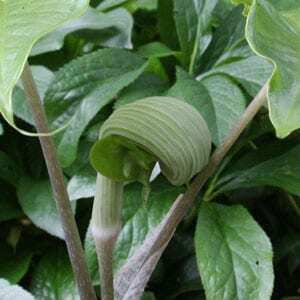 Botanical Name – Arisaema ringens. Flowers – Dark purple, to mid green spadix depending on the form. Foliage – Mid to deep glossy green. Drought tolerant – Medium, once established.